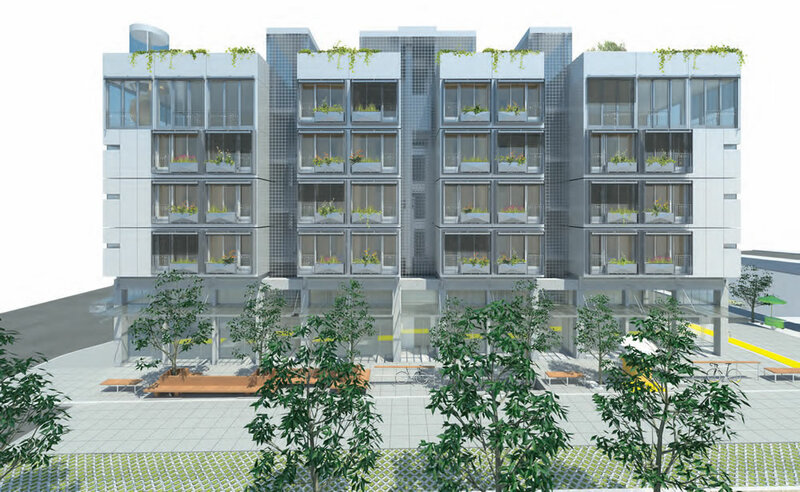 Having first revealed the plans for 26 modern condos and a beer hall concept to rise on former Central Freeway Parcel T along Octavia Boulevard, we now turn our attention to the plans for 56 rental units – including 34 micro-units – and 8 micro retail spaces to rise on the adjacent Parcels R and S in the heart of Hayes Valley. 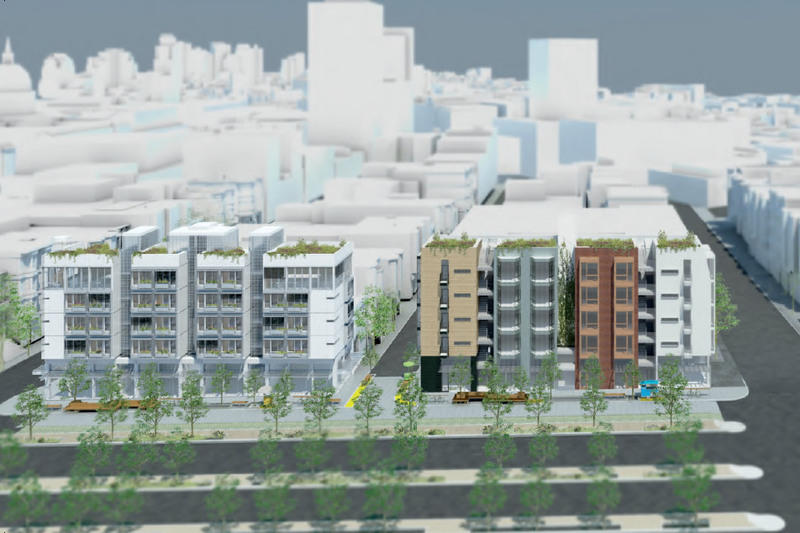 With the development rights having been awarded by the city, Build Inc. plans to build two five-story buildings upon the skinny parcels between Oak and Page, parcels which are currently planted as community gardens. Dubbed “The Karl,” the proposed building to rise on Parcel R between Oak and Lily would consist of 34 self-contained “CoLiving” suites averaging 174 square feet apiece, 273 square feet for the 6 handicap accessible units, over four individual micro retail spaces along the street. 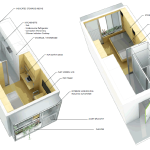 The design for the building includes additional shared living, dining and kitchen areas on the top floor. Classified as “Group Housing,” the development would not be subject to Below Market Rate (BMR) regulations. 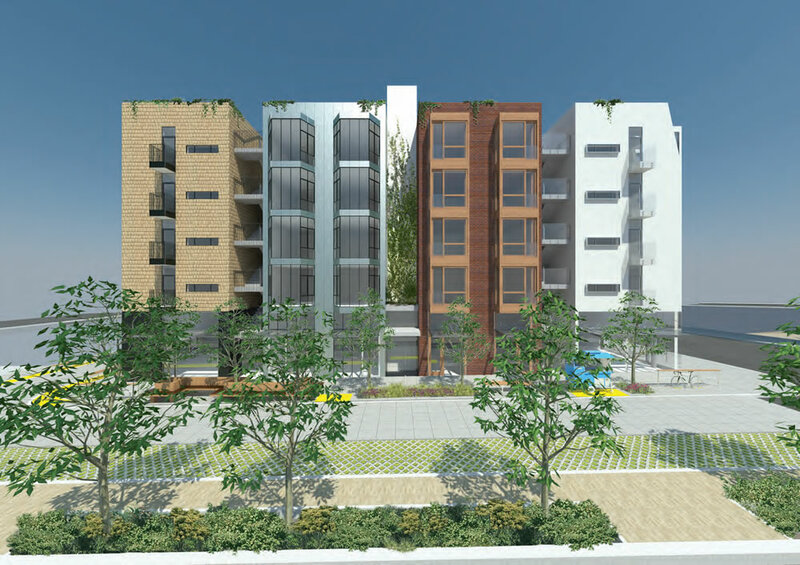 Dubbed “The Neapolitan,” the proposed building to rise on the former Central Freeway Parcel S between Lily and Page would consist of 22 traditional apartments: ten two-bedrooms averaging around 600 square feet and twelve 271-square foot studios. Designed by Macy Architecture, the Neapolitan building’s mass is broken down into four 24-foot wide segments, creating four “Mini-Buildings,” each finished in different materials and styles with four micro-retail spaces at their base. As conceived, the existing community gardens on Parcel R & S would be relocated to the roofs of the two new buildings. And in terms of timing, they’re shooting for occupancy by the end of 2017. We propose a targeted transformation of the Side Access Lane along Parcels R & S into a “tabled”, traffic-calming Shared Public Way that is friendly to pedestrians, bicyclists and slow-moving motorists alike. Since it is not always necessary for thru-traffic access, the portion of the new Shared Public Way adjacent to Parcel R can, on occasion, be temporarily closed off for public events. 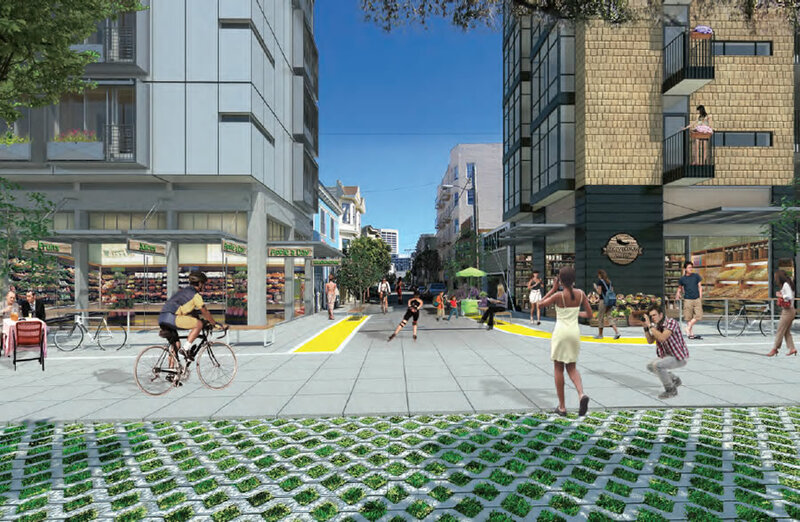 By shifting the parking to the west side of the street, driver-side door conflicts with bicyclists would be eliminated and the parking lane would also help buffer the Public Way from the high-speed boulevard traffic on Octavia. Great solution for very tight parcels. 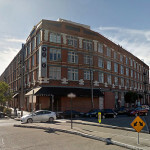 Micro units make a great deal of sense in this location. In a place with lots of street life and cafes, your living room can be right out your front door. I like the diverse architecture in this proposal. Well done, I think. Very nice. But it looks like the easement street is going to be closed down for pedestrian and bike traffic? Would that affect only this block? See UPDATE above with respect to the proposed plan for the existing access street and the construction of a new Shared Public Way (without the loss of any parking). Exciting! Although i have to say there is nothing cheesier than breaking up a building’s mass by changing “styels”. It’s a cheap trick you see in the suburbs all the time. It’s reducing SF’s significant architectural periods and reducing them to a Disney-level caricature of architecture. It’s like the EPCOT of SF styles, except none of them are good or high quality. If they’re going to go this route at least need to simplify it a little. Shoot, I see SS scooped me on the next post. At any rate, these ARE four separate buildings (excepting the shared podium) connected by the open catwalks/stairwells. You only see this type of 360 differentiation on interconnected modular (prefabricated) towers. It wouldn’t make sense to build individual towers like this using conventional techniques. Although, even with separate masses, I supposed their is a “fauxness” to it all. Love the micro-retail spaces on every inch of the ground floors. This ‘hood will be adding over 1,000 new residents in the next few years – nice to add more retail to service them. Any updates on the next block north – east side of Octavia between Oak and Fell? Or any updates on Parcel O – the huge parcel along the south side of Fell Street, from Laguna almost to Octavia? Wondering about O myself. Just asked the editorial research team at SS. As for 1000 new residents; seems more like 5-7,000 but I’m including a 5 block radius. These look pretty damn good to me too. The idea of “group living” is interesting. The treatment for the street in front is genius. It’d be a fantastic way to use all of the space in front of all of these parcels—as pedestrian priority/porous surface. Not to mention putting the famed public garden on the roof. Well done, all around. glad to see they’re being included! Quick. Someone pick up some Rogaine. Or I’ve seen this exact picture at the salad bar section with alfalfa. Mirco-units may work for some who don’t mind living in tight quarters. Amoebas, for one. These small units make my house look like Buckingham Palace and my rent-control units huge and highly desirable. Who am I to complain when these set a new standard for $ per square foot. 174 sq ft? Yeah, awesome. The bathroom of our master BR is about that size. Maybe I should airbnb that out and make a couple thousand a month. So, where are the plans for the extra Muni trains/buses that will be needed? Where are the plans for the extra cops? The additional schools and teachers? The social workers? The jails? The sewage treatment plants? I’m not against development at all. SF didn’t build much for about 50 years and we need more housing. But I fear the city has property tax $$$ in their eyes with no thought to the added public infrastructure and personnel costs and needs that a growing population will require. Oh, brother….the city actually charges fees for development that are (supposed) to help with many of these costs. But in general, these modest projects will have almost no incremental impact on any of the issues you’ve identified. Adding people at the heart of an urban area has MUCH less impact than greenfield development in the burbs and exurbs (CARS and all their environmental externalities). 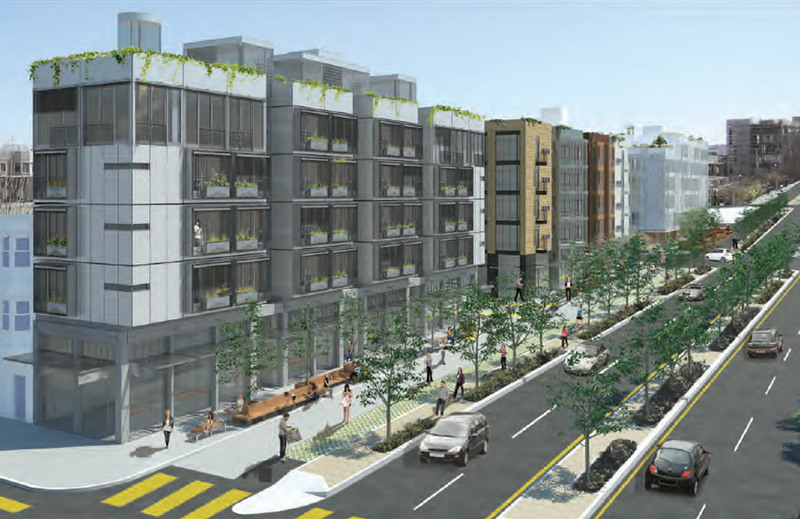 The impacts of development were fully investigated in the Environmental Impact Report for the Market/Octavia Plan, and mitigated or accepted as appropriate. (I don’t remember off-hand if there were any mitigation fees passed as part of the process). There are specific fees required along with entitlements that address much of the inventory you post — schools, transit, open space — but even more substantial is what’s in the Market-Octavia Plan: a much more robust, site-specific set of fees and infrastructure obligations that were approved in 2007, especially intended to make sure the redevelopment of the Central Freeway Replacement parcels contribute to a full range of infrastructure investments. It’s odd that you’d choose this site as the one to make your “no thought to the added public infrastructure” complaint about — if anything, the Market-Octavia Plan and the Central Freeway parcels set the standard for addressing exactly what you are worried about. Yes, yes, I know all about the Market-Octavia plan. This comment was not directed at this specific development but all the new development generally. But even the Market-Octavia plan, which uncharacteristically at least thought about these issues, does not seem to really address them as far as I can tell. Just says something along the lines of “need to keep these things in mind, will deal with it later and there will be costs . . .” If there is something more specific than that on the example issues I note, maybe someone can point me to it. UPDATE: The floor plan and projected rent for the 174-square-foot suites. The “Karl”? How ’bout the “Hutch”? Still, I like the buildings. Who ARE you people praising these soulless bunny hutches for humans?! You are welcome to move to Alabama and live in a giant bunny castle for 100 dollars a month. I think these places are wonderful and hope to live here. I would absolutely love to reserve one of these. I would love to rent one. I am selling my town house in Utah and want to move to San Francisco and live here. I think it is perfect and exactly all I need. Please let me know how I may secure one. Does anyone know? I have been searching so much and am very motivated to secure one for when they are ready. While the development team had pitched occupancy by the end of 2017, the ground for this project has yet to be broken. That being said, the paperwork to secure building permits has just been filed. And if you continue to plug in, we’ll keep you posted. Cheers. Thank you! I will keep checking up on this. I will be your very first renter. I will secure one as soon as they are ready. All I need is a new and clean place (since I do not smoke nor have any pets) to place my drawing table and memory foam mattress. This is perfect. I am an author illustrator who will be an art teacher soon. I will find a place in SFO to live and then secure one of these a year of two years from now. You are welcome to contact me with an application when you begin to rent them in 2017 or 2018. I appreciate the value of something brand new and affordable in a city this unique. Turns out these will probably be 100% affordable housing spaces. You might want to look into the BMR program to see if you fit the requirements. I found an awesome studio by the beach in SF and love it. I may still look at these but I do not qualify for section 8 if that is what you mean, I have too much money… I am in love with where I live but you never know…. Thank you so much for responding!